The Lifeguard Trials Adventure Training Course was born out of request from the RAF looking to provide their servicemen and women with a comprehensive course in water sport skills & safety. It was devised to be practical and motivating and since its subsequent success, both the Army and Navy have adopted the challenge as part of their Adventure Training Courses. Painstakingly designed to offer just the right balance of physical challenges, intellectually demanding exercises and transferable operational skills, the Lifeguard Trials ticks all the boxes. The Adventure Training Course is intended to run hand in hand with the Tri Services’ high standards and core values of developing leadership, teamwork, stamina and other personal qualities such as awareness, communication and courage that are necessary to enhancing operational effectiveness. How do Lifeguard Trials work? The Lifeguard Trials are neatly divided into two fun sessions with a break for lunch. 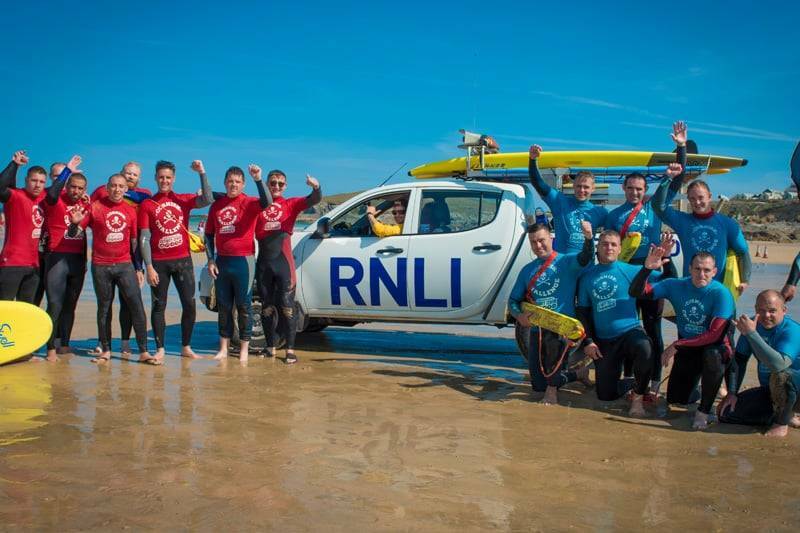 On arrival at the Newquay Activity Centre our team of friendly lifeguard qualified instructors will lead you down to Fistral beach where you’ll learn to perform some fundamental lifesaving skills that are part of the Internationally recognised beach lifeguard training course (SLSGB). With the theory behind us, the action begins! Depending on the tide and level of adrenaline troops are seeking, we’ll lead you on one of our many technical and award winning coasteers. Coasteering is physically demanding yet a hugely fun extreme sport. Troops will be given a point-to-point orienteering exercise to complete where they’ll learn to climb and traverse efficiently along Newquay’s craggy cliffs. Exposed to a certain degree of danger, they will also negotiate natural rapids, sluices and whirlpools before attempting heart stopping sea cliff jumps. Having been exposed to such risk in an unfamiliar ocean environment, troops will have the opportunity to develop fear management techniques. If that’s not enough, we’ll also throw in a testing rescue scenario for the troops to resolve. With the SUP anchored 200m off the coast they will have to devise a rescue and evacuation plan, drawing upon skills delivered during the morning session. Then, working as a team they will have to paddle the casualty back to shore on our Super SUP. In doing so, their stamina, endurance and navigation skills will be put to one final demanding test. Receiving rave reviews from armed forces adventure training groups, Newquay Activity Centre in Cornwall is a certified ISA and Surfing England Centre of Excellence. This means you’re guaranteed the highest level of tuition in the industry.